I’ve been sitting on this one for a couple weeks (shut up!). I can barely take it any longer. I keep seeing the HBO teasers and am tickled to pieces this is coming to the U.S! 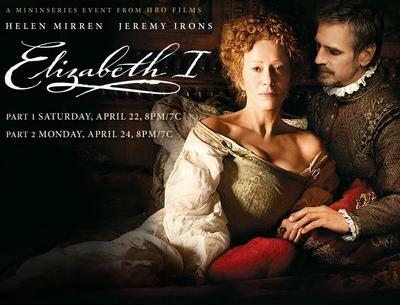 Starring Helen Mirren & Jeremy Irons. That is all. I die. This had garnered some awardage last year in the U.K. I’m impressed that HBO jumped on it. And it looks to be an improvement on “The Virgin Queen” (blech! though duff is super cute in the virgin role) that aired earlier on Masterpiece Theater. OOOH! Juicey Jeremy Irons 🙂 Can’t wait! I will have to keep an eye out for it. Hopefully they will show it on CBC here in Canada. Helen Mirren is an amazing actress. Thanks for posting this bit of info.